17. 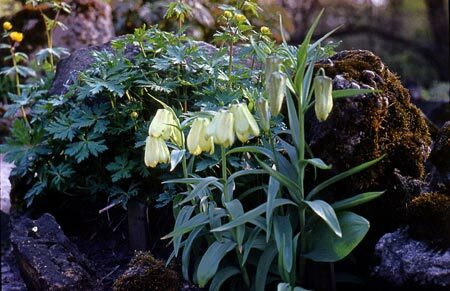 Fritillaria Linnaeus, Sp. Pl. 1: 303. 1753. Herbs perennial, bulbiferous. Bulbs with (1 or)2 or 3(or more) fleshy, farinaceous scales, often covered with a translucent tunic, sometimes also with numerous small bulbels. Stem erect, simple, leafy. Basal leaves petiolate; cauline leaves sessile, spirally alternate, opposite, or whorled; leaf blade oblong to lanceolate. Inflorescence 1- to several flowered, racemose or umbellate; bracts (floral leaves) usually present. Flowers bisexual, usually nodding, campanulate to saucer-shaped. Tepals 6, free, often tessellated with dark and light colors, with a nectary near base adaxially. Stamens 6, inserted at base of tepals; anthers basifixed, rarely dorsifixed. Style 3-lobed or subentire, caducous; stigmas linear or very short. Fruit a capsule, erect, 3-loculed, 6-angled, winged or wingless, loculicidal. Seeds arranged in 2 rows in each valve, flat. About 130 species: temperate regions of the N hemisphere, mainly in C Asia and the Mediterranean region; 24 species (15 endemic) in China. Some species are cultivated for their bulbs, which are used medicinally.